The fabric structure was an economical and practical solution for the baggage handling area. Fabric-over-frame structures are becoming increasing popular at airports throughout the country. Modern fabrics are an economical alternative that are durable, practical and safe. To maximize the benefits of fabric, Crawford, Murphy & Tilly (CMT) customizes its application on a specific structure based on size, operations, site location, adjacent structures and many other engineering-related factors. Our innovative approach to fabric solutions provides clients with maximum value when compared to simply following manufacturer-suggested applications. 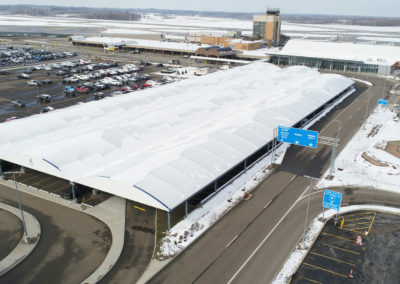 At Akron-Canton Airport in Ohio, CMT completed two fabric structures that demonstrate how fabric structures can be the ideal solution when expertly executed. 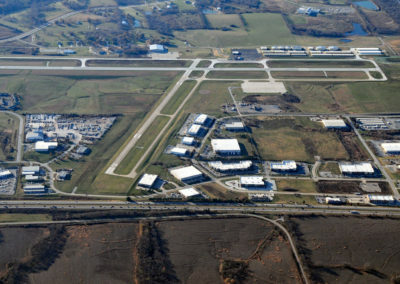 The outdoor baggage area at Akron-Canton Airport was subjected to adverse weather conditions that routinely impacted operations. CMT evaluated the airport’s needs and determined that a fabric structure would provide the best value in addressing this issue. In addition to the reduced cost when compared to using traditional building materials, the fabric alternative allowed for faster construction, while still providing a 20-year lifespan and meeting all fire and building code requirements. The fabric’s transparency also allows for the transmission of natural light, reducing energy costs. The project’s total cost was $2.5 million. 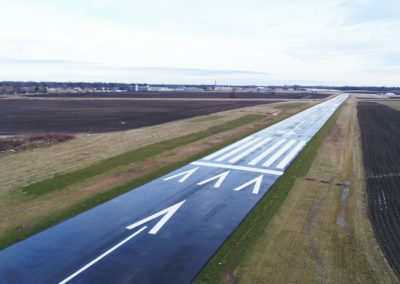 As part of a project to expand and improve the airport’s entrance roadway and parking lots, CMT led the development of a fabric canopy, nearly three acres in size, that covers the parking areas and travel lanes. The structure was designed to match features of the terminal. CMT worked with the manufacturer to amend specifications that would allow the structure to withstand snow loading at nearly double the weight required by code, and provided a custom gutter system to address snow/water runoff.